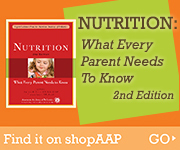 The American Academy of Pediatrics believes that healthy children receiving a normal, well-balanced diet do not need vitamin supplementation over and above the recommended dietary allowances, which includes 400 IU (International Units) of vitamin D a day in infants less than 1 year of age and 600 units/day for children over 1 year of age. Megadoses of vitamins—for example, large amounts of vitamins A, C, or D—can produce toxic symptoms, ranging from nausea to rashes to headaches and sometimes to even more severe adverse effects. Talk with your pediatrician before giving vitamin supplements to your child.